Last updated on 6 September 2015. There's not much point lending your money if you can get similar rates with savings accounts and cash ISAs! 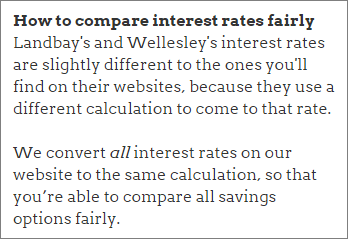 That's why it makes sense to compare the P2P lending interest rates to the very best savings accounts and cash ISAs (tax-free savings accounts) on the whole market. Skip to the end of this article for a quick list of the risks, pros and cons of P2P lending versus savings accounts. And please go to Get Started With The Safest Peer-to-Peer Lending Websites to see how we classify these as “safest”. Look to the contents on the right for the type of account you want (e.g. easy access, three-year fixed rate and so on). We only exclude savings accounts that are difficult to open or operate, or that have tricky small print. All interest rates are annual rates. “Easy access” means you can get your money back at zero cost in just hours or days, either online or by telephone, with unlimited withdrawals. Landbay's interest rate tracks the Bank of England base rate + 3%. The figure is slightly higher here than on its website because Landbay doesn't account for you earning interest on top of interest. Bear in mind that to get your money back in peer-to-peer you need to sell your loans to someone else. There is usually someone to sell to within 24 hours or, at most, a few days. There could be some tougher times, e.g. when there are rising job losses and more lenders want to call in their loans to get to their savings. RCI Bank deposits are protected by the French Deposit Protection Scheme, not the UK's. Kent Reliance Building Society has an unusually high minimum savings amount of £1,000. One-month accounts are for those of you who want to be able to get your money back within one month and are operated over the internet or by phone – or by post if the deal is exceptional. Charter Savings Bank and Aldermore have unusually high minimum savings amounts of £1,000. One-year fixed accounts are for those of you who want to save or lend for one year at fixed interest rates. We show internet and phone accounts – and postal accounts if the deal is exceptional. Al Rayan Bank and Kent Reliance have unusually high minimum savings amounts of £1,000. The BM Midshires account can be opened online or by telephone, but to withdraw your money you have to notify them by post. Saga's account is for over 50s only. Three-year fixed accounts are for those of you who want to save or lend for three years at fixed interest rates. We show internet and phone accounts – and postal accounts if the deal is exceptional. Charter Savings Bank has an unusually high minimum savings amount of £1,000. Five-year fixed accounts are for those of you who want to save or lend for three years at fixed interest rates. We show internet and phone accounts – and postal accounts if the deal is exceptional. Secure Trust Bank has an unusually high minimum savings amount of £1,000. Lend to successful buy-to-let borrowers. Landbay can repossess the buy-to-let properties and sell them to recover your money, if necessary. All loans are for no more than 80% of the estimated property value and averaging less than 70%. All properties produce rent at least 25% higher than the monthly loan costs. Landbay has a small bad-debt provision fund. We're waiting for a few small details from Landbay to finish calculating its 4thWay® Risk Rating**, but we're confident that it is comparable to the other P2P lending opportunities mentioned here. No one has lost money through Landbay. Visit Landbay* or read more in Get Started With The Safest Peer-to-Peer Lending Websites. Lending Works is highly selective of its borrowers. Just 5% of loan applications turn into loans. Lending Works has a moderate-sized bad-debt provision fund and its the only consumer P2P company to have insurance to cover losses if a borrower is unable to pay due to unemployment or accident. Lending Works has a calculated 4thWay® Risk Rating** of just 13: again, not far off the top scores of 0-8 out of 50 for savings accounts. No one has lost money through Lending Works. Visit Lending Works* or read more in Get Started With The Safest Peer-to-Peer Lending Websites. No lender out of around 18,000 lenders has lost money on RateSetter in the four years since it started. This is partly down to it offering loans to “super-prime” borrowers only. These borrowers are mostly individuals, but now perhaps 20% of its loans are business and property loans, which are further up the risk scale. RateSetter lenders' zero losses are also down to its very big bad-debt provision fund. Due also to its long and outstanding record, RateSetter has the lowest 4thWay® Risk Rating** of 10/50, very nearly as safe as savings accounts (which have a maximum rating 8/50). Visit RateSetter* or read more in Get Started With The Safest Peer-to-Peer Lending Websites. Zopa is the oldest P2P lending website in the world and probably the only one to have gone through a deep, deep recession and yet come out with a gold medal. It has a ten-year record of low losses and, indeed, zero losses since it created a bad-debt provision fund. Since 2010, bad debts have average a meagre 0.25% per year. Its calculated 4thWay® Risk Rating** is 12/50, making it nearly as safe as savings accounts (which have a maximum rating 8/50). Visit Zopa* or read more in Get Started With The Safest Peer-to-Peer Lending Websites. Tick for savings! Savings accounts (including cash ISAs) are safer than even the safest peer-to-peer lending companies from a sudden crash and economic disaster. Tick for peer-to-peer lending! However, you're far, far more likely to preserve and even grow your wealth with peer-to-peer lending, because the interest rates you can get with savings accounts and cash ISAs are, usually and on average, too low to keep up with rising prices. Tick for peer-to-peer lending (sometimes). Many P2P lending companies will allow you to get out of your loans and get all your money back early without cost. (From those above, that includes Landbay) However, if lots of lenders want to leave at the same time, it could still take you a while. Cross for savings. To get reasonable rates, you usually have to tie your money in for many years. You pay high penalties for leaving longer and fixed deals early. Cross for savings. You can usually expect interest rates on savings accounts and cash ISAs to be lowered at the earliest opportunity. This will be as soon as a fixed period is over or when the bank has hit its new deposits target. Cross for peer-to-peer lending. Not all the safest P2P lending companies will always remain the safest. This is the key difference that makes them not the same risk as savings accounts. Sometimes, these businesses will come under intense business pressure to weaken their safety standards and the less disciplined ones will do so. If you sign up to our newsletter, 4thWay® will keep you up-to-date on whether standards have slipped, so you can avoid lending in their newer, riskier loans. Cross for peer-to-peer lending. Normally you can sell your loans easily and get your money back quickly. However, during severely bad circumstances, you might not be able to get access to your money for weeks or months, or to do so you might have to sell them for less than they're worth to another lender. Cross for peer-to-peer lending. If you want to keep all your money on loan, you need to re-lend your loan repayments and interest. Although this is usually quick, it can sometimes take days and even longer. This effectively lowers your interest rate from the quoted rate, but probably just by a few tenths of a percentage point each year, on average. Landbay is an exception to that last bullet point: you receive interest from day one. *Commission and impartial research: our service is free to you. We already show dozens of P2P lending companies in our accurate comparison tables and we keep adding more as soon as they provide us with enough details. We receive compensation from Funding Circle, Landbay, Lending Works, RateSetter and Zopa, and other P2P lending companies not mentioned above when you click through from our website and open accounts with them. We vigorously ensure that this doesn't affect our editorial independence. Read How we earn money fairly with your help. Sources: I used 4thWay® data for the best peer-to-peer lending products. I used Moneysupermarket, Which? and Comparethemarket data, and my own research, to find the best savings products.